A Wimbledon property with a new lean-to extension at the back of the house. 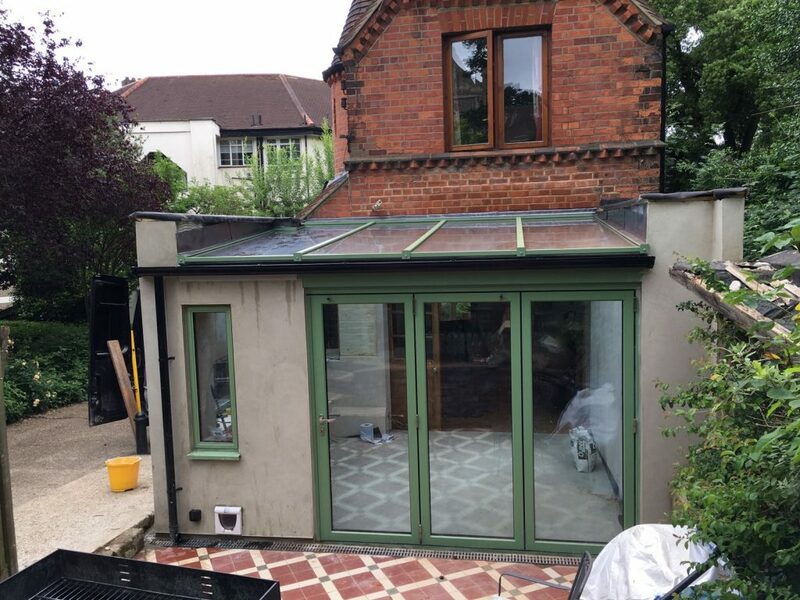 This new lean-to features a new aluminium roof, window and bifolding doors. This new extension starts with slimline glazing bars to the roof. Just three bars create a slimline appearance and with the large safety glass fitted to the roof. There is a new Aluk aluminium casement window in a top hung style, sitting upon an aluminium cill. The window has multi-point locking, a locking window handle and internal glazing beads for security. Beside the window is a three-panel set of Origin bifolding doors. The doors slide to the right, viewed from the outside and pen out. There is a traffic door on the left, hinged on the middle panel. The traffic door allows the bifolds to be used just like a conventional back door, without having to fold the panels back every time. The bifolds have contrasting door furniture in brushed satin stainless steel to contrast against the heritage green polyester powder coated finish. - Aluminium Roof Aluk Windows and Origin Bi-folds. - Polyester Powder Coated in a modern green colour. - Doors glazed with toughened safety glass, with soft-coat low-emissivity coating, warm edge spacer bars and argon gas fill. - Bifold with external drainage in front. - Slimline aluminium roof with contemporary roof bars. If you would like to improve a space in your home with a modern glass room, contact us today or visit our showroom. Our quotations and home surveys are free.